There is nothing like being completely surprised at enjoying a book so much – not because you expected to dislike it – but because it was simply unknown and full of possibility, and you know that finding gold is rare indeed. 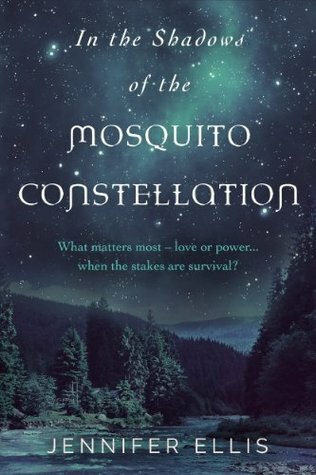 I can’t recall how, but soon after starting this site I came across Jennifer Ellis’ writing blog and became intrigued by what she had to say as an author, and by the description of her novel In the Shadows of the Mosquito Constellation. Though I didn’t win it through a Goodreads give-away, it proved enticing enough for me to purchase an e-copy, which turned out to be a great decision. I hope that more interested readers will discover this author and her fine post-apocalyptic novel. In the Shadows of the Mosquito Constellation is set on a fragile communal farm, a cooperative precipitously balanced between opposing camps of personality and goals as they struggle to maintain an island of civilization in a world rent asunder by economic and social collapse. Central to the community is Natalie and her husband Richard. Founded with family and friends in a move toward self-reliance during the start of the world’s collapse, the farm represents a new and defining beginning for Natalie. However, for Richard, a rising Vancouver politician, the farm is just Natalie’s pet project that by fortune became a safe haven to temporarily hold over until government regains control in the city and the good old days can return. As friction in their marriage builds through Natalie’s increasing independence clashing with Richard’s personality of stubborn control and dismissal, Natalie finds herself drawn to the comfort found in the opposite personality of Richard’s twin Daniel. Faced with threats both from outside their isolated community and from betrayals and secrets within, Natalie and the other members of the community struggle to maintain a pocket of order, peace, and justice in the surrounding post-apocalyptic nightmare reality. The plot of In the Shadows of the Mosquito Constellation may seem rather familiar. A tight-knit post-apocalyptic community struggling to keep civilization in the chaos that surrounds. A cast of characters with disparate motivations and conflicting personalities bringing crises intentional and unintentional to the balanced status quo. A female protagonist showing independence who becomes stifled by her domineering husband and who is emotionally turned upside down by her attraction to another man. Yet, despite their familiarity, Ellis masterfully weaves these elements into a riveting story filled with characters that seem honest and real. In other words, she takes familiar story ingredients and uses them in precisely the right fashion and proportion to make a literary meal that satisfies. The characters are mostly very well-rounded, both primary and secondary. While a few display a bit too-exaggerated villainy, this is an exception. For the most part the people in this novel are a combination of good and bad attributes, sympathetic and unsympathetic motivations. Natalie is a fine example of a woman displaying great strength, yet also signs that she is capable of so much more if she could just work past weaknesses. Daniel, in another example, shows qualities of heroism and seems at first glance to be the kind of perfect gentleman that a woman would swoon over. Yet Daniel’s apparent perfection for Natalie is shown to be illusory, with Daniel containing weaknesses that make him fail to live to his potential. Meanwhile, Richard who is shown in many instances to be a horrible person and spouse, is also realized as having important strengths and assets which in some ways make him fit perfectly in relationship with Natalie. The triangle between these three characters and there imperfect relationships that nonetheless manage to balance one another is much akin to the overall balance in community member individuals in forming the farm society as a whole. How should a society work? If democratic, how should that work? How do we exist as both individuals and balanced communally. These are the matters at the heart of the novel, and Ellis does a fantastic job at posing all of these issues in an entertaining read. Another strength I found in Ellis’ writing with In the Shadows of the Mosquito Constellation is her sense of pacing and scope. The novel includes portions both in the farm community and contains excursions into the outside world, there are periods of calm and of action, of emotional reflection and serious dialogue, and each is handled fluidly. Despite my only mentioning Natalie, Richard, and Daniel here, there are several other characters, including some other point-of-view characters, giving a range of experiences that are beyond the scope of my comments here, but each were as well-handled as the main characters. A final point I wanted to make concerns the romantic aspects of the novel. I am not one for romance stories, particularly when they become saccharine or depressing (either a bit too perfect or too ill-fated). There are many women writers out there who make a living writing books for a primarily female audience. They do what they do well I assume, just as there are male writers that write things targeted for male readership. I don’t know the demographics of Ellis’ readership (intended or achieved) but In the Shadows of the Mosquito Constellation is definitely not something that should only appeal to or be read by women. The romantic aspects to the story are importantly vital, and brilliantly rendered by the novel’s close. Just as the characters of In the Shadows of the Mosquito Constellation struggle to maintain a balance between individual freedom and group responsibility, openness and safety, etc so too does a writer need to find a balance between the familiar and the alienating, action and still moments, entertainment and relevance, and so on. Ellis’ ability at balance is really impressive, and I’m looking forward to reading more of her work – and would even love more stories in this universe. Most other readers that are willing to give her work a try should feel similarly. 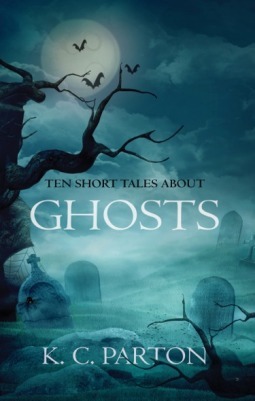 After reading this collection I considered wether there was any significance to the chosen title Ten Short Tales About Ghosts as opposed to Ten Short Ghost Tales. I’m not sure as to an actual answer, but it did get me thinking in conjunction to my feelings about the collection overall. Namely that it truly is composed of stories about something, rather than being that thing itself. In other words, the stories here are pastiche (even derivative), written with inspiration from – and in conscious homage to – classic English ghost stories in the vein of M.R. James (a writer who also inspired John Bellairs, one of my favorite Gothic children’s book authors). Parton’s stories are really about these old classic stories, they are not particular novel in their own right. The real consideration to make if deciding to read this collection, then, is whether one is looking for stories that are hauntingly familiar and warming in a nostalgic way, or if true chills from unexpected directions are sought. The ten tales (and one ‘bonus’ poem) here are hit-or-miss, though some will likely resonate with readers depending on their recollection of similar classic tales. The Last Train and The Heinkel were both relatively notable as well done homages. I personally found The Reader to be the most compelling story in the collection, familiar yet eerie and a worth James homage. I also enjoyed the opening story with the uncertainty (at least briefly) of whether the ghost was really present or not. This opening tale rung familiar in its similar tone to something out of the Scary Stories To Tell in the Dark children’s series. The enjoyment of nostalgia faded rapidly, however, through stories that continued in similar charted territory with very little diversity from what would find in those classic English ghost stories of a hundred years past. Taken in smaller sips in a different environment than the airport where I read this may have altered my appreciation of the stories, but I found myself rapidly losing interest in their routine familiarity. Disclaimer: I received a free advanced electronic reading copy of this from the author via NetGalley in exchange for an honest review. An anticipated sequel to his 2006 hard science fiction novel Blindsight, Echopraxia exists in the same ‘universe’ but can easily be read on its own as the two novels do not directly share any characters and the plots of each are self-contained. While largely disconnected by story or character, these sister novels do share style and theme, so that those who have read Blindsight can reasonably expect to find a similar work here. Each novel is staggeringly intelligent, dense with science, technology, philosophy, and speculation. The major theme of Blindsight is speculation on the evolution of consciousness and intelligence. In Echopraxia these themes are revisited, but they are expanded upon into new arenas, not merely rehashed. I personally found the first novel both infuriating and wondrous. Much of how I responded to it held true for my reaction to Watt’s latest. 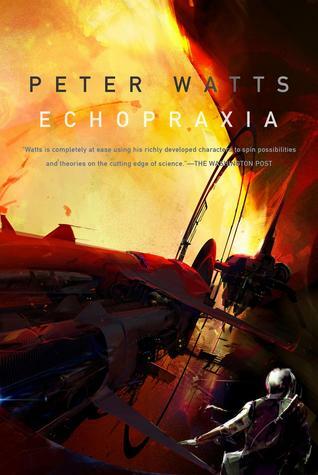 However, I began Echopraxia actually relieved and hopeful, for in addition to its heady, hard SF mastery, it appeared to not be avoiding actual action. The novel opens with Daniel Bruks, a field-biologist who has fled into exile into a remote wilderness. Bruks has fled from a humanity that is becoming decreasingly biological in favor of technology and computation, and he has fled a horrific violence for which he unwittingly served as pawn. A sudden attack on an isolated desert monastery near Bruks pulls him into their conflict with other factions of Earth’s growing post-human society and leads Bruks, along with some other visitors to the monastery, on the monk’s journey to discover a truth of the divine at the center of the solar system. As Blindsight contained the very basic SF trope of first contact as a basis for its deep investigation into those themes of consciousness/intelligence, Echopraxia‘s plot at its simplest level bears familiarity to the much maligned Star Trek V to delve more seriously into the concept of the divine and of faith and science in understanding/predicting the universe. I personally find myself drawn to these themes, and for that reason (in addition to some more moments of entertaining action) I ended up appreciating this novel to its predecessor. The heavy nature of the ideas in Echopraxia make it a novel that really requires rereading to sufficiently grasp, and it is the type of novel that makes you want to talk to other people about, at least in terms of those themes/ideas. Thus, as with Blindsight and much of hard SF, the ideas here trump the actual fiction. Over some drinks you’ll want to talk about the science and the speculation on matters religious and biological and physical. You won’t want to talk about the characters much or what happened in the story because those details are all relatively throwaway. As fascinating and as intellectually stimulating as Echopraxia is, its entertainment never goes beyond academic. So filled with post-human characters and events the very human reader finds very little to emotionally connect with, leaving the novel feel rather hollow outside of the ‘hard SF/technology’ department. This novel is going to be loved by people who appreciate a secular and actual scientific take on the concept of divinity and who aren’t uncomfortable with emphasis on speculative, sometimes disturbing, scientific content above more traditional aspects of story. While not my favorite kind of SF, this is well done. Disclaimer: I received a free advanced electronic reading copy of this from Tor Books via NetGalley in exchange for an honest review. Somehow, this notably well-reviewed novel slipped under my radar even past its release. Only upon perusing the Blogging for Books offerings did I discover it, and I am glad I chose to give it a try. If you haven’t heard about A Constellation of Vital Phenomena yet, or if it has been sitting on your to-read or consideration list, I’d recommend getting a copy ASAP. Then clear some nights for engrossed reading. For those not familiar with the plot of Anthony Marra’s award-winning novel, it is set in the war-ravaged region of Chechnya and traces the intersecting experiences of a small cast of characters as they struggle for life, a combination of survival and purpose. When Russian soldiers come for her father, eight-year-old Havaa flees into the surrounding Chechen woods, where her father’s friend Akhmed rescues her and takes her to hide at the nearly deserted hospital. There, the sole doctor left in this war-torn wasteland is Sonja, a European-trained physician who has returned through a sense of responsibility both to home and to a sister that has gone missing. Reluctantly, Sonja agrees to help care for Havaa, and – in testament to dire conditions – accepts the inept medical help of Akhmed, who has failed out of medical school and yearns more for artistic expressions. Thrown together in awful circumstances, these characters share a stubborn commitment to hope for individuals and a future that fights against the despair surrounding them. With recollections of the past years of the Chechen conflict, and the constant threat that present friends may turn on them for personal gain with the Russians, these characters discover their lives intertwined, past, present and future. The novel’s title comes from a definition for life given by a medical text/dictionary in the novel. The term is remarkably difficult to biologically define in one sentence. Typically, biologists will talk of characteristics of life, rather than settling on a strict definition. But the one here given title is particularly resonant in capturing the essential sum of those characteristics of life. They form an interlocking constellation of phenomena, individual traits that put together form a picture unique and new with a story. Similarly like stars each of the characters in Marra’s novel interact together to form a constellation in this historical space of humanity. Metaphorically one could speak of a certain balance between the stars in forming a constellation. 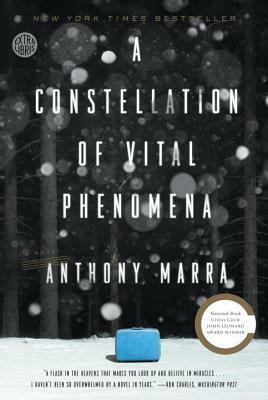 Similarly, Marra’s novel succeeds so well because of the careful balance he is able to strike in its construction. The shifts in time from chapter to chapter (or even within chapters) is managed without any sense of rupture or confusion. Each of the characters is an interesting balance of strengths and weaknesses and even the villains are shown with traits of sympathy and compassion. The emotional weight of A Constellation of Vital Phenomena could quickly take it into a story that feels utterly bleak. Marra nicely finds balance here as well, with the character’s vital hopes and perseverance working to counter the negative, and the young Havaa in particular offers a bright ray of humor and compassion that symbolizes a certain hope for the lives of a future generation. The events of the novel’s ‘present-day’ plot consist of a mere five days, but A Constellation of Vital Phenomena takes these points to form a picture over decades of conflict, personal and spiritual. The novel will pass similarly fast while reading, but its power and humanity will echo with the reader far longer. Disclaimer: I received a free copy of this from the Crown Publishing Group via their Blogging for Books program in exchange for an honest review. 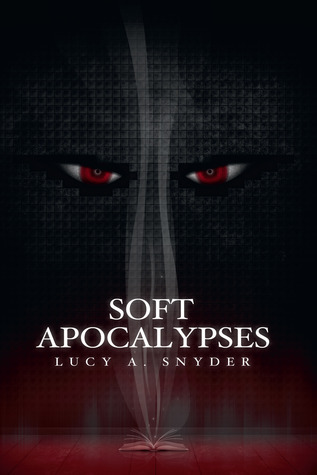 Lucy A. Snyder’s SOFT APOCALYPSES – Free Signed Copy GIVEAWAY! I am very pleased to announce the FIRST Reading 1000 Lives free book giveaway, with many more hopefully to come in the future! 1 SIGNED copy of Soft Apocalypses, the new collection of stories by Lucy A. Snyder, courtesy of the wonderful folks at Raw Dog Screaming Press. “Lucy A. Snyder proves once again that she is fearless in mapping every corner of the literary landscape. Not content to be confined to any single region, she guides readers through dark realms of fantasy into the churning industry of steampunk, from the dizzying heights of science fiction down to the most desolate depths of horror. Paperback, 158 pages, signed by the author. HOW TO ENTER: Send an email to my hotmail email address (bacterialover[at]…) with “Soft Apocalypses Giveaway Entry” in the subject line. Include your name and mailing address in the body of the message so I know who/where to send the copy. I will not retain the information or use it for any other purpose. The winner will be chosen randomly and informed by email prior to shipping. DEADLINE: Monday 1st September 2014 at 5PM Eastern time. Share this with your contacts and friends and please follow for more reviews, news, and giveaways in the future. And good luck!! 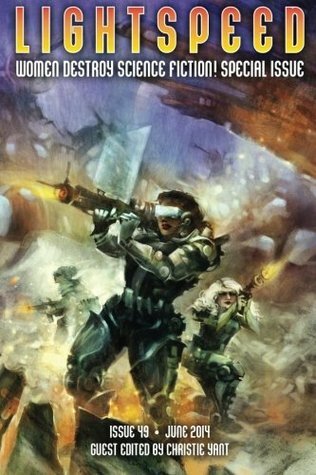 Though I’ve read plenty of shared-universe novels, they all have fallen into the media-tie-in category, but I’d been intrigued by titles in the Abaddon catalog and the apocalyptic/post-apocalyptic setting of this “Afterblight” series seemed like something I’d easily enjoy. And this omnibus collection ended up being basically what I expected, nothing flashy or awe-inspiring, but a fresh and varied series of genre stories that keeps the reader entertained. Each of the three novellas in the omnibus has its positive qualities, but each also came with problems for me. As such, no single story stood out above the others: none exceptional, yet each ultimately satisfying and worth the read. 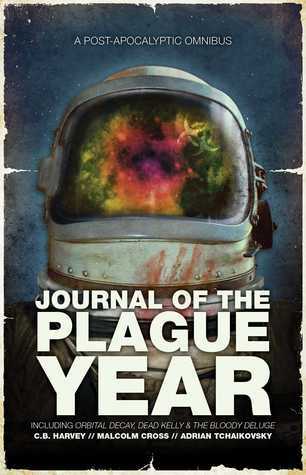 What impresses me most about Journal of the Plague Year is how unique each of the three novellas is. All apocalyptic, each falls into a particular sub-genre. Orbital Decay has an emphasis on science fiction, and in terms of plot and set-up I found this the most intriguing. The American and Russian crew aboard a space station in orbit of Earth watch in isolation from the rest of humanity as the disease known as “The Cull” begins to spread throughout the world. The physical and psychological stresses of space coupled with international and personal tensions between crew-members become exacerbated as the characters watch the Apocalypse unfold below them to friends and family and some struggle to figure out the disease’s cause and how safe they are on the station. The strengths of Ross’ contribution to the omnibus center on the characterizations, their individual psychology and interactions. Unfortunately in terms of science fiction, serious errors occur when dealing with biology, with Ross apparently confusing critical differences between viruses and bacteria. The sections dealing with the nature of the disease took me right out of the story into sighs and groans. There are also a lot of technical details in the story, but I can’t really comment how believable or accurate these were. Dead Kelly is best classified in crime, or horror, being a tale full of degenerate criminals struggling for control and pursuing personal vendettas in the power vacuum following civilization’s collapse. Kelly is the former leader of a group that fell apart when a big heist went sour. Having faked his death, Kelly has been hiding out in the Australian outback, but now returns to his old familiar haunts and colleagues in the new post-Cull world. This story has a lot of raw energy, with a protagonist who is both revolting and compelling depending on the particular passage being read. It is a brutal story of betrayal, justice, and revenge. And as such it is a lot of fun. Readers that can’t stomach intense situations or unlikable protagonists won’t want anything to do with this. The overall tone of Harvey’s novella as a revenge tale is rather familiar, however. Most of the story proceeds in expected fashion and thereby comes across as too simplistic. But to Harvey’s credit, it does end in a particularly strong fashion that is unexpected, yet ends up feeling just right. The Bloody Deluge was the deepest of the three novellas, about big ideas of faith versus reason, order versus chaos, freedom versus control, hope versus despair. Here, Tchaikovsky tackles the big issues of what could happen to society and individuals faced with a post-apocalyptic landscape. Set in Eastern Europe, it has a certain novelty of setting, which helps against the familiarity of tackling these sorts of issues in the post-apocalyptic genre. Though the themes are well-worn, Tchaikovsky still has important things to say and handles them in a far more balanced and nuanced manner than I first expected. This final novella falls into a general adventure genre where a group of individuals on the run from one cult-like community/power ends up falling into the protection/influence of another. The story can be separated into three distinct parts: the chase, the rescue/protection, and an ultimate battle. I found the final portion vastly superior to the opening, which really seemed to drag. I’m glad I stuck with it to read completely, but it would’ve been improved shortened. In the end this should be a straight-forward decision for anyone considering reading Journal of the Plague Year – it’s safe to judge on its marketing appearance. If apocalyptic sci-fi and adventure stories are a genre you generally enjoy then this is worth checking out. If you are looking for a particular kind of emphasis (sci-fi, horror, or adventure) then you may want to just read a particular novella here rather than them all. Disclaimer: I received a free advanced electronic reading copy of this from Abaddon Books via NetGalley in exchange for an honest review. “Love is the Plan the Plan is Death”, by James Tiptree, Jr. Many things out there seem to be an all-male’s club (or predominantly so). It kinda boggles my mind that statements like those above were ever tossed around in the field – or that they even are still today. Compared to the past there are a lot of women science fiction writers out there, as this collection testifies. Part of any issues I feel come down to the matter of the definition of science fiction. What is ‘real’ science fiction? There is no single answer, and to some the answer is a sub genre that may be called hard science fiction which ultimately will come down to facts related to physics. As there appears to be fewer women in the ‘hard’ sciences (a separate problem in itself) it comes as not too big a surprise then that there aren’t many female science fiction writers that could be put in that category of ‘hard SF’. Yet, even when they could, it seems like their inherent gender make people consider them something else. Take Margaret Atwood – a writer whose stories feature reasonable futures based on present-day scientific reality (a relatively narrow, but common definition of hard SF as put forth recently for example by Norman Spinrad in Asimov’s). Her work is easily classified as hard science fiction. But she herself eschews the label, preferring to call her work speculative fiction to avoid the negative associations of ‘science fiction’ with a particular kind of space story and an interest in scientific details over a more human or literary picture. Whatever the definitions and whatever the reasons why some have an issue with women writing science fiction, the stories here prove that one should be overjoyed if they continue to find voice in ‘destroying’ science fiction. The stories included here make this easily a year’s best of collection in itself. They are varied in tone from the humorous to the serious, and in genre from hard and futuristic to the more fantastic (alternate) historical. As such, unless you enjoy a wide range of types of stories, there may be some stories in here that just don’t interest you despite each truly being top-notch. I personally had my favorites within each section of new fiction, reprints, and flash fiction. And there were some I just didn’t enjoy though I recognized their merits as intended. However, even if you only like a particular kind of story in the SF landscape, the collection is well-worth the cheap admission price. I particularly liked the opening story by Seanan McGuire. Out of all the stories in this collection I feel this one significant to discuss due to its embodiment of what the entire collection represents. There are conflicting expectations in a collection with the theme this Lightspeed issue has. On the one hand one has the expectation that the stories will relate the female-specific condition within the confines of the genre. They ‘should’ feature female characters that aren’t stereotypes, they ‘should’ deal with feminist issues, they ‘should’ focus on matters unique to female biology and social practices built around that. Yet, on the other hand the point is that women writing science fiction should be no different, no less worthy or capable, than men writing it. And the point is that there is no single thing that women writing science fiction ‘should’ write about. If a female author writes a story with no female characters that says nothing about her gender, does that matter? Does it by virtue of her gender automatically become a feminist work even though the story itself is so devoid? Seanan McGuire’s “Each to Each” is brilliant in its playing with expectations of what females are, the roles they ‘should’ serve, and how they are viewed both by others and by themselves. These sorts of themes echo throughout the remainder of the collection, whether explored implicitly or explicitly. The stories (and the nofiction in the issue) don’t offer any kind of clear answers to the matters of dealing with gender disparities, or of dealing with the general Other. Instead they offer a celebration of what all is possible with women writing science fiction. That celebration shows that women writing science fiction is just simply humans writing science fiction – a world of disparate experiences and possibilities, with aspects that no one really has a premium on beyond the fact that each is a personal story, unique and meaningful each to each. They are women, but they are not just women. They are Charlie Jane Anders. They are Rachel Swirsky. They are Marissa Lingen. They are Nisi Shawl. They are. And listening to their voices is the closest we can come to understanding them, and for that their talented and competent voices deserve to be heard, however they choose to raise them. One of the things I really enjoy with Lightspeed Magazine are the author interviews that accompany each story, that highlight the individual and personal nature of each story. These give insight into the author’s inspirations, writing process, and at times show interpretations which may coincide or be different from the reader’s. The other nonfiction here includes a host of personal essays. I found these okay by and large, though I do wish there were one or two longer and more in-depth essays or analyses rather than the more brief or superficial feel that some of these had. If you haven’t picked up this issue yet, I really encourage you to do so, and to look for the two upcoming Women Destroy… issues featuring a Fantasy and a Horror focus, and the Queers Destroy… issue that will follow. Decades ago a large part of science fiction was not just about technological or scientific speculation but also social speculation, a means to explore the disenfranchised and the Other. It is nice to see something returning in full force to this purpose.